Dornogovi aimag. Region of Mongolia. Aimag. Aimak. Place to visited in region of Mongolia. Sights of intersest. Dornogovi aimag is situated in the South-East of the country and borders on the South with the People's Republic of China. This wide area is a semi-desert zone, with a hard and sandy soil. Territory is famous for medical herbs such as liquorice, cuscuta australis, and annual, perennial species, including wild leek, saksaul, elm, allium mongolicum and saltwort. Of wild animals there are wild horse, wild sheep, ibex, black tailed antelope, white antelope and lynx. Birds include condor and eagle. These species can be found on the hills of Otsol, Sansara, Ikhe and Baga Dulaan, Argalant, Khorgo, Budryn Uul, in the steppe of the Tuulait and Tariachfh, in the hollows of Gurban Bayan, Unegt, Tughum, and on the wide semi-desert of Bulan saaral, Gurvan Khashaat, Khonich, Burdene Uul, Dalai Bumbat. The industrial base consists of 7 big and 50 small and medium-sized factories, operating in areas such as mining, food processing and construction. Railway over 311 miles (500 km) long crosses 6 somons. Infrastructure consists of railway, telecommunications and roads. The territory of the Dornogobi aimag Is dotted with rocks that appeared during various ages is Mongolia's Gobi Desert region. Under pristine conditions and with its wealth of stone tools, petroglyphs, bronze and iron tools, tombs, ruins of cities and towns, and other valuable historical and cultural monuments the Gobi Desert attests to being the birthplace of mankind, as does its significant paleontological discoveries, such as the petrified fossils of dinosaurs that existed over 80 million years ago, sea creatures and plants, petrified wood, footprints of marsh heron, zebu, and ostriches inhabiting the area 30 million years ago. The region has been explored over a lengthy period by the Italian trader Marco Polo, the Russian geographer N. M. Prjevalsky, the Russian scientist and geographer V. I. Obruchev, Russian tourist P. M. Kozlov, and other scientists and researchers, all of whom have devoted a sizeable number of their research works to the flora and fauna and geographical landscape of the aimag, and to the traditions and lifestyles of its human inhabitants. Dornogobi aimag is located in the desert steppe zone of southeastern Mongolia, 1,200-1,600 meters above sea level. It is one of the hottest and most windswept areas of the country. The flora and fauna typical of desert steppe zones is widespread throughout Dornogobi. Whilst there are no large rivers in the territory of the aimag, it does have sizeable resources of subterranean water and many small lakes, rivers and springs. Dornogobi numbers over 1 million head of livestock, mostly sheep and goats. Founded in 1931, the Province borders on the Sukhbaatar aimag to the east, on the Khentii and Gobisumber aimags to the north and borders China to the south. Covering an area of 115 thousand sq. 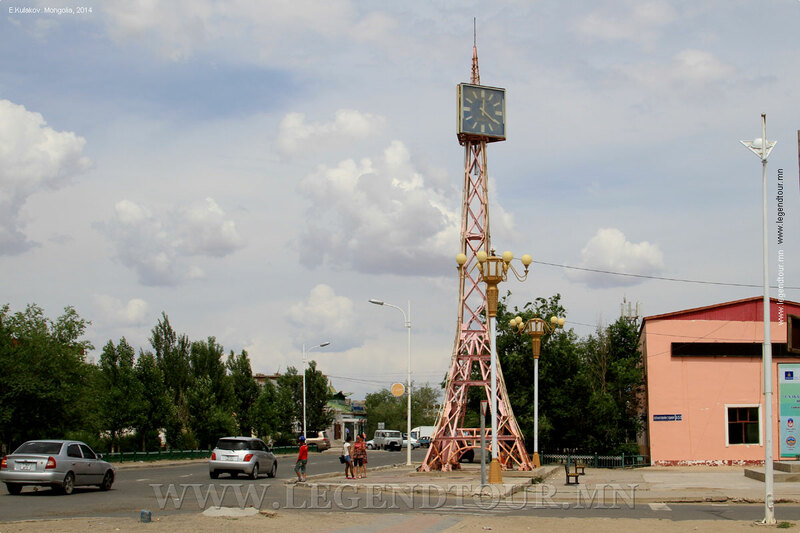 km, Dornogobi has a population of 50 thousand, 70 percent of which live in towns and settlement areas. The center of the aimag, Sainshand, is 463 km from Ulaanbaatar City and is a main international railway hub. It has reserves of fluorspar, oil, and bituminous coal. In the 1950s, oil was extracted at the Zuunbayan soum and, at present, a plant is being built to reinstate oil extraction. Dornogobi has a railway station linking Moscow-Ulaanbaatar-Beijing, a medical museum, the music and drama theater named after Noble Saint Danzanravjaa, an ethnographic museum, an electrical power plant, food mills, and trade and cultural centers. Sainshand. Population 20,000. Elevation 938m. One of Mongolia's most dusty and dry aimag capitals, Sainshand (Good Pond) is important primarily because of it's location. The city was founded in 1931 and was called Tushet Khan aimag during Manchu rule. It is on the main rail line to China, and not far from the Chinese border. Sainshand City Museum. This recently renovated museum houses some interesting items. There are plenty of stuffed Gobi animals, a collection of sea shells and marine fossils (Dornogov was once beneath the sea) and some dinosaur fossils. 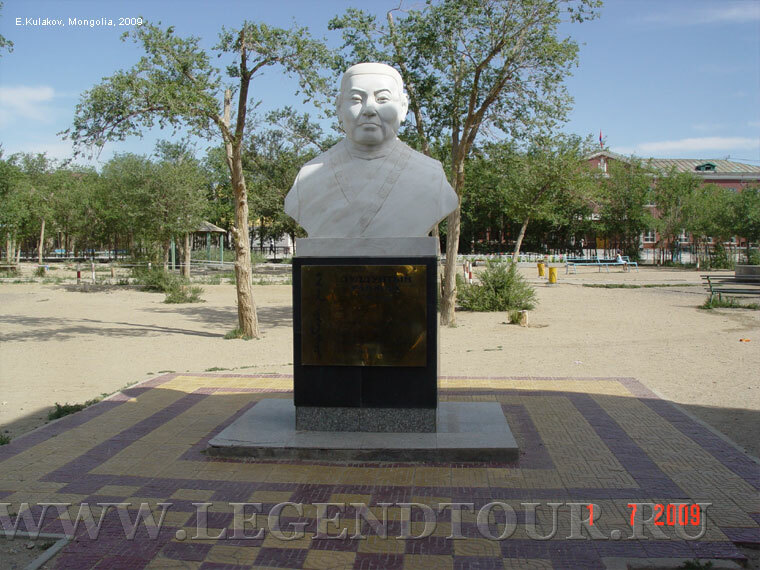 The history section includes some eulogies to Manzav, the local baatar (hero) who distinguished himself fighting for Mongolian independence during the 1921 revolution. Look out also for the 13th century wooden breastplate worn by a Mongol soldier in Korea and the Morin Khuiir (horse-head fiddle), from 1940, decorated with carved images of Lenin and Sukhbaatar. Museum of Danzanravjaa. Noyon Khutagt Danzanravjaa (1803-56), a well-known Mongolian writer, composer, painter and medic, was born about 100km south-west of Sainshand. The museum has a collection of gifts presented to Danzanravjaa by Chinese and Tibetan leaders, costumes used in his plays, Buddhist statues presented to him by the 10th Dalai Lama, and some of his paintings. He was also very interested in traditional medicine, so the museum has a collection of herbs. Look out for the jar in front of his statue, which contains the Danzanravjaa's bones; the poet's mummified body was burned along with his monastery in the 1930s. Dashchoilon Khural Khiid (Dashchoilon Khural Monastery). This monastery, opened in 1991, is in a large walled-compound at the northern end of the central district. There is an active temple, and though visitors are welcome, photographs are not allowed inside. The 25 monks are very friendly. Khar Uul. If you have time on your hands, locals recommend the two-to-three-hour hike out to Khar Uul (Black Mountains), south-west of town. Take lots of water - this is the Gobi, after all. Khamaryn Khiid (Khamaryn Monastery). This new monastery, an hour's drive South of Sainshand, has grown up around the cult of Danzanravjaa, whom many local people believe to have been a living god. His image is sewn into a carpet that hangs in the main hall. The original monastery and three-story theatre, built by Danzanravjaa in 1821, was destroyed in the 1930s. The surroundings hold meditation caves and retreats used by Danzanravjaa and his students. Zamyn-Uud. This town has only two claims to fame: it's right on Mongolia's southern border and it is the hottest place in the country. 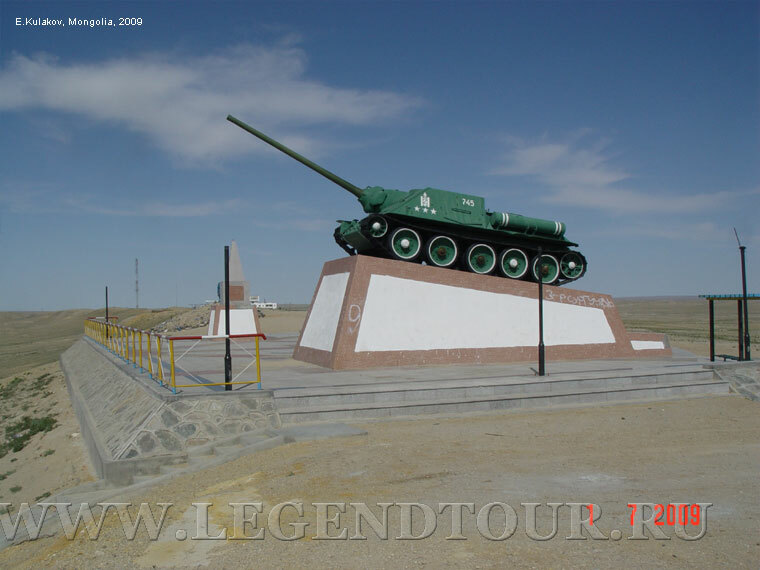 The only reasons to come here are to save money by travelling from Ulaanbaatar to China on local trains, rather than on the dearer international Trans-Mongolian Railway; or if you are planning to visit obscure villages by train in Inner Mongolia. Desertification is a real problem here and sand dunes are starting to pile up between buildings. The map of Dornogovi aimag.